Ever wonder how your faith will hold up when faced with some pretty serious trials? All of us face various trials at one time or another in life. When we do, how does our faith play out in the midst of adversity? Do we rely on God more, or turn away? Many of you know I am facing some heavy stuff. For those who are unaware I am going through a divorce. This is the first, and possibly the only, time the subject will be discussed here on the blog. It is not something that is easy for me to talk about. In the midst of that I am searching for a place to rent and trying to get my life put back together. Add some serious financial issues to that and I would say I am facing some rather serious trials at this time. Naked I came from my mother’s womb, and naked I will leave this life.The LORD gives, and the LORD takes away. Praise the name of the LORD. If you’ve never read the book of Job I’m going to spoil it and give away the ending. Because of his faithfulness, God restores everything Job had lost and then some. God allowed Job’s suffering for a time, but then blessed him even more. After reading Job again I was reminded of a couple of things. 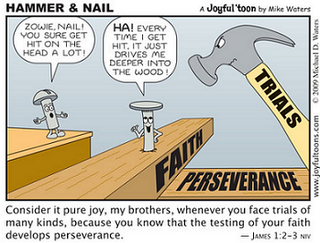 Trials test and refine faith – The book of James tells us that we should consider facing trials a “great joy” because the “testing of your faith produces endurance”. (James 1:2-3). Job’s faith was tested. He passed the test and the result was a deeper faith in God. My faith has been (is being) tested. I’m learning to trust Him more and hoping I’ll be as Job and pass the test. It is all in God’s time – Job suffered for a time, then God stepped in and rewarded Job for his faith. He allowed the trials, but He restored Job (his health, prosperity, family, etc.) when His time was right. It is not easy to wait for something. I’m learning, however, that no matter how much I pray it is not about my timing. Things will happen as He wants them to and when He wants them to. In addition to Job, God gave me another good reminder this past Sunday. Our pastor’s sermon was “Defining Discipleship” and taken from Luke 14:25-35. Two things the pastor said struck me. 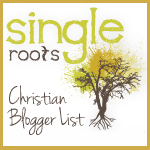 Everyone who wants to follow Christ is in for full-on discipleship, or they are not in at all. Salvation costs you nothing, but discipleship will cost you everything. I was reminded of my questions and doubts. The first statement put those to rest. When I made the decision to be a Christ follower it was a lifetime commitment. There is no such thing as a part-time Christian. You are either a follower of Christ or you are not. But, following Him won’t be easy as the second statement suggests. The salvation part is easy. It is a totally free gift for all who will accept it. The hard part is truly being His disciple. That is where we face the trials. We are called to give up everything – our possessions, time, devotion to others – in order to fully follow Him. That ain’t easy! So, with all that said here is where I stand today. I’m still facing the same issues (divorce, financial, job, housing) as before. The difference is how I’m viewing these difficulties. I’m not yet to the point I consider them a “great joy”, but I realize that trials test my faith and produce endurance. I’m trying to look at everything I’m going through as a stepping stone in my faith walk. No matter what I face, He is with me. I believe that He has great things planned for my life. I’m learning to be patient and wait for His time. While I wait I pray I can be like Job and keep my eyes focused on Him. The LORD gives, and the LORD takes away. Praise the name of the LORD! I’m so sorry you are walking through this valley right now. Please know you and your girls are being prayed for during this time. He is faithful and it is all in his time. I know that for a fact.